A rich, gooey, cream cheese brownie recipe flavored with pumpkin and spice. Preheat the oven to 350°F and generously grease a 13 x 9-inch baking pan. Break the chocolate into small chunks and combine with the butter in a microwave-safe bowl. Microwave on high for 2 minutes, or until the butter is completely melted. Stir until the chocolate has melted and the mixture is smooth. Add the brown sugar and continue stirring until thoroughly combined. Beat 4 of the eggs together with 1-1/2 teaspoons of the vanilla extract in a separate bowl. Stir in 1 cup of the flour and combine well. Add the chocolate mixture and continue mixing until smooth. Spread the batter into the prepared pan. Combine the cream cheese and pumpkin purée with the last egg and remaining quantities of flour (2 Tbsp) and vanilla (1 tsp). Add the granulated sugar and, using a wire whisk, combine until smooth and creamy. 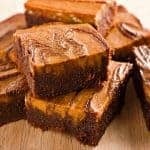 Drop large spoonfuls evenly over the brownie batter and swirl in with a knife. Allow to cool completely before cutting into 24 squares. Store in the refrigerator and set out at room temperature for about 15 minutes before serving.